If you are looking for a private New Smyrna Inshore charter boat, we customize your experience to include sightseeing if desired. Rates vary depending on the number of people and length of time of the trip. Please click button below for all options and pricing or call for more information. Inshore Fishing in New Smyrna Florida is the areas most popular activity – Go with the best local New Smyrna Inshore fishing charter and join us aboard our expert and professional charter fishing boats. We go to where the fish are everytime, and get there faster. We are highly rated, reliable and take pride in what we do and it shows in our reviews. Come see for yourself and get hooked what others are already experiencing! If you’re searching for more of an outdoor adventure on the water, a whole new world of experiences are waiting for you inshore or near shore as some call it. It’s always calm, never worry about seasickness on a full day, three quarter day and/or half day inshore fishing trip. 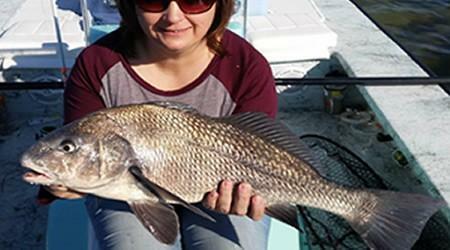 Depending on the season, New Smyrna inshore fishing charters hook up on Redfish, Snook, Tarpon, Black Drum, Trout, Snapper, Sheepshead and Sharks. New and experienced anglers will love the size, the fight, and the taste of these species. So, jump aboard for a New Smyrna inshore fishing charter experience that is certain to be the highlight of your vacation! We offer full day, three quarter day and half day private inshore fishing charters every day of the week. We have beautiful boats and experienced captains that absolutely love to see customers catch fish. The best fishing is conveniently located in New Smyrna, it’s 20 minutes from Daytona, 20 minutes from Port Canaveral and just a stone’s throw from Melbourne, Cape Canaveral, Cocoa Beach and short convenient drive to Orlando, Disney World, and Universal Studios. 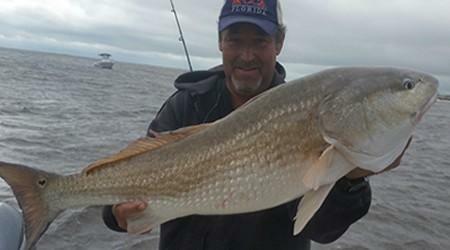 Did you know that New Smyrna is one of the best places to fish for Redfish in the World? This is because it is relatively close to the gulf stream and deep in the Ponce Inlet. Our captains know how to cater to all level of customers, from seasoned anglers to people that have never held a fishing rod. And our fishing charters are great for kids and families as well. If you look at our reviews, photo gallery, videos and fishing reports, you will see that we have a wide variety of customers and fish that we catch on a daily bases. We promise all customers and you that no one will try harder or be more motivated to show you New Smyrna inshore fishing charter than our team. We only offer private fishing charters, which means we cater to only and your group on the boat with our captain. Your party will have all of the attention and catch all of the fish. To view all our rates, click availability button our check our rates page. We are a local business and have been in business for over 20 years and many of our captains are among the best and have been with us more than 10 years! Our captains are all full-time new Smyrna fishing guides, this is what they do every single day. Fishing is what we do and is in our blood and we can’t imagine doing anything else. We all talk and share spots with each other, and as the bite changes throughout the day. This allows all of our customers to have the best possible fishing experience. After each trip the team comes together to make plans for the next day, so that we can make sure you get the best experience possible every time. Our customers have also provided us with greatest reviews and a top ranked New Smyrna Fishing Charter for New Smyrna on TripAdvisor, Facebook and Google! 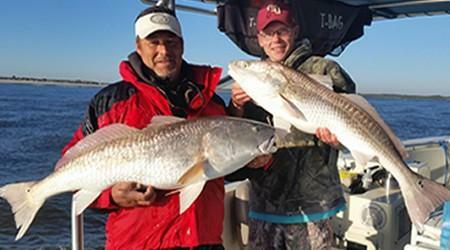 Did you know that New Smyrna is one of the best places to fish for Redfish in the World? This is because it is relatively close to the gulf stream and deep in the Ponce Inlet. Our captains know how to cater to all level of customers, from seasoned anglers to people that have never held a fishing rod. And our fishing charters are great for kids and families as well. If you look at our reviews, photo gallery, videos and fishing reports, you will see that we have a wide variety of customers and fish that we catch on a daily basis. We promise all customers and you that no one will try harder or be more motivated to show you New Smyrna deep sea fishing than our team. We only offer private fishing charters, which means we cater to only and your group on the boat with our captain. Your party will have all of the attention and catch all of the fish. To view all our rates, click availability button our check our rates page. Our captains are all full-time fishing guides, this is what they do every single day. Fishing is what we do and is in our blood and we can’t imagine doing anything else. We all talk and share spots with each other, and as the bite changes throughout the day. This allows all of our customers to have the best possible fishing experience. After each trip the team comes together to make plans for the next day, so that we can make sure you get the best experience possible every time. Our customers have also provided us with greatest reviews and a top ranked New Smyrna Fishing Charter for New Smyrna on TripAdvisor, Facebook and Google! New Smyrna Fishing Trip Details! End of trip, captain will return you to starting location. Take a Look at what Our Customers are saying!